FoolProof provides a free consumer life skills curriculum to middle and high school teachers. Our curriculum teaches a new type of financial literacy. We immerse kids in the importance of both healthy skepticism and caution. We teach concepts and habits that can travel with a young person thru life. Is the FoolProof curriculum a real curriculum? Definitely. Our curriculum meets or exceeds state and national financial literacy guidelines and standards, including integration of Common Core requirements. We give you a rigorous, full semester curriculum. And you can use one module or all of our modules. Consumer advocates, teachers and students. Not marketers. Our curriculum features highly interactive, self-grading lessons called "modules." The modules are video-driven and feature peer-to-peer teaching. Does FoolProof provide supplemental teacher resources? Yes! We give you 16 individual assignments to help students hone their critical thinking skills. And we also provide you 16 group activities for the classroom. Does the FoolProof curriculum work with other financial literacy resources? Yes. FoolProof can be used exclusively or as an important supplement to your current resources. Does FoolProof work as homework? Definitely. Some schools require all students to complete FoolProof's curriculum as homework. Students can work on any device, anywhere with web access. And they can stop and start at any time. Students register themselves with a code provided by you. You can monitor one student or an entire class simultaneously from any device with web access. The software grades all tests. You can customize the curriculum to keep students on track. Learn more about our program below and start FoolProof today. FoolProof is all about becoming a "Healthy Skeptic." New to FoolProof? Start using FoolProof within 24 hours! The curriculum is free for all users. The Campaign for a Commercial-Free Childhood and 12 other child advocacy experts and consumer groups now endorse FoolProof's Consumer Life Skills Curriculum for Middle Schools. The iconic Newseum in Washington, D.C. hosted the press event. FoolProof meets most state and national financial literacy guidelines and standards and is listed as a resource by the Jump$tart Financial Coalition. FoolProof provides you many teacher tools, including teacher guides and suggested daily lesson plans. FoolProof has been a good tool to supplement my classes, lining up very well with my curriculum. The titles of the modules are catchy, easy to use, and the teacher resources are very useful. It all helps engage the students in the subject manner. I have used FoolProof regularly now for about 2 years. I am always looking for up to date and engaging material for the subject, and I found it in FoolProof. This program has been a life-saver for me. I teach 7th and 8th grade and the students really enjoy this program and have learned more than I expected. Love what you have put together here! I think this generation of teachers/students are so fearless and filled with an integrity and truthfulness that we have never seen! You amaze me. I have sent your link on to lots of my fellow teachers — wishing you great success! Just to let you know that the program has been very successful here with my classes, and whenever I ask for feedback on what we have learned, it's mostly the FoolProof stuff they talk about! 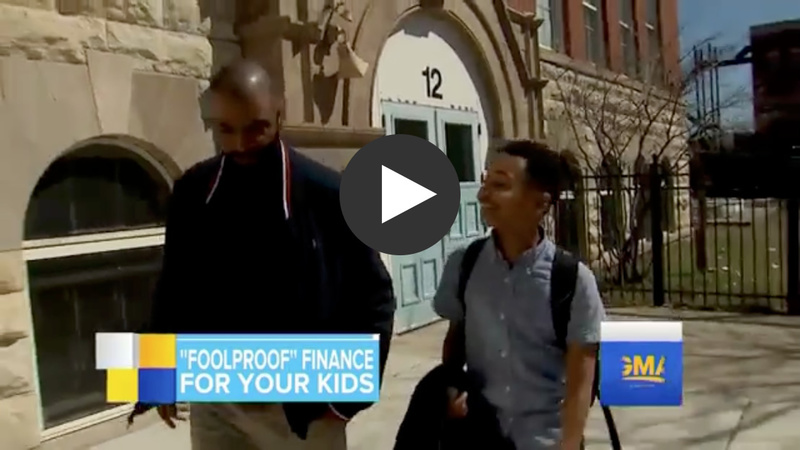 The FoolProof team believes that some financial literacy programs offered to young people are driven by the wrong agenda. For instance, many programs developed by financial institutions either put forth the agenda of those institutions or neglect to cover important topics that might conflict with the institutions' goals. A perfect example is the way virtually all financial literacy programs associated with financial institutions present credit cards. The programs normally don't say the most important thing about credit cards: you should always try to pay off your card balance in full every month. A credit card company can't say that message strongly and clearly. The card companies would go broke if all their customers actually paid off their balances. That's why credit card companies—including those from banks and credit unions—push all consumers to charge more than we can afford to pay off every month. The companies want us to finance our purchases. But what's good for the company in this instance isn't good for you or your students. Here's how we explain the danger of credit cards to your students. And here's what we say about most advertising. We developed FoolProof to provide straightforward, independent information that really equips young people to deal with the intricacies of the financial system and the consumer marketplace. The power of FoolProof comes from our strong, independent nature: we are consumer advocates. Our messages for high school students were developed to protect the students, not push any product or service. For instance, FoolProof may be sponsored in schools by a credit union. But no credit union has any input or influence over FoolProof's messages. Work through our modules and then tell us if you think we've succeeded in our mission: real consumer advocacy, not infomercial. Module 1 Who Will Be in Charge of Your Life? Core message: You are not what happens to you. You are what you decide to be. Middle school students are forming the lifelong habits that will determine their character and impact their economic and emotional welfare going forward. Module one shows these students that they can be in control of this process. Looking at the qualities that make us respect others and others respect us. Empowering the students to determine the type of person they wish to become. Encouraging students to embrace tough decisions rather than avoiding them. We introduce the amazing power of habit-building. Core message: A young person makes lots of decisions every day, without even thinking about it. And many of those are probably unwise. We show students that they have the power to make smart decision-making a habit. Learning the fundamentals of skilled decision making. Developing the habit of avoiding bad decisions. Understanding that the courage to make the right decision can be a learned habit. Core message: We explore the concept of scarcity. Because time and money are limited, we show young people that they can't do and can't have everything they want. We show how choices impact every part of our life. We show the students that the free enterprise system places the responsibility on the person to make the right choice. We further explore the importance of caution and critical thinking into the decision-making process. Module 4 Who And What Should You Trust? Core message: Trustworthiness is a noble quality and impacts every part of our lives. Trustworthy decisions are what make our lives better. But it is a lot easier for any of us to make an untrustworthy decision than make a trustworthy decision. We explore the questions, problem, and solutions related to trustworthiness in personal relationships and in the marketplace. How do you decide if a person is trustworthy? What information do you need to make a trustworthy decision on issues that impact your welfare or your money? We let students discover the power of caution when making decision. We present skills that allow a young person to make trustworthy decisions. We put them thru exercises that show them how to identify trustworthy information sources. Core message: Virtually every waking minute since birth students have been inundated with marketing messages. Very few students understand the impact of that inundation. Module five is a very realistic at the way the everyday actions of a young person are being shaped by marketers. We show students that identifying hidden marketing messaging is an easy and fun habit to develop. We allow the student to practice identifying trustworthy information sources. We present a primer of marketing tactics. We explain that the marketers job is to sell, not necessarily do what is best for the consumer. We revisit the concept of a young person being in control of their life and re-emphasize that control will not happen if a person is not a healthy skeptic. Module 6 When Opportunity Cost Smacks You in the Face! Core message: Module six immerses the student in the importance of opportunity cost in the decision-making process. The module builds on lessons learned in the previous modules and addresses practical skills. Interactive exercises allow a student to determine the opportunity costs in many different scenarios. We introduce the budgeting process as a key part of understanding opportunity cost. We show the student why every spending decision comes with an opportunity cost. We reinforce the principle that time-like money-is a perishable commodity. Core message: We expand our look at the role of marketing on every single aspect of a student's life, from year one onward. We present the Free Enterprise system as the backbone of America's economy, but outline the responsibilities the free enterprise system puts on all of us - particularly when you are young or the member of an underserved community. We interactively encourage students to discover the nature of marketing: the sellers job isn't to say bad things about its products or services. We use the marketing campaigns of companies that students know intimately to show students how these campaigns attempt to manipulate them. Core message: Understanding "debt" when you are young means you'll have a lot more control over your life later. We teach that debt may be necessary, but for most people debt is not a "good thing" - the message presented to young people constantly by credit card companies and other marketers. We use weightlifting to show students see the impact of unnecessary debt on a person's life and general well-being. The real costs of debt. How poor debt habits may already be impacting you. How to learn habits that prevent you from taking on unnecessary debt. Learning budgeting and spending practices. An introduction to credit cards and their potential danger. Core message: You're going to be in trouble if you don't understand what happens on the web. The importance of using the web defensively. How to use the web defensively. Understanding that virtually nothing is private when you use the web. Understanding why many websites and apps exist: primarily to gather information on you. How advertisers can manipulate you on the web. How to recognize scams on the web. Module 1 When it Hits the Fan! Core message: Your credit will rule your life. Understanding You and your money. Basic fundamentals of money and decision making. Identify the role of money in your life. Explore the common mistakes made with money. Identify the consequences of being irresponsible with money, including the impact on job prospects. Examine the real-life scary look at financial scams aimed at young people. Identify the real-life potential dangers of poor decision-making regarding money. Module 2 Breathing Without Air! Core message: You are the only person who determines your credit. Identify what a bad decision is using examples based on teenagers' common mistakes. Identify the role of credit in your life. Identify what mistakes can be made with poor credit decisions. Explain the importance of paying on time. Explain the dangers of minimum payments. Identify what a credit score is and identify the five factors that control credit score. Identify and comprehend risk-based lending. Module 3 Kick Some Buck! Core message: Smart consumers critically evaluate marketing and advertising messages rather than simply accepting them. Demonstrate personal responsibility when it comes to credit. Identify the components of a credit score. Separate fact from opinion when you evaluate products and services. Critically evaluate fine print in marketing, advertising and promotion. Identify predatory lending and how it may affect you now and in your future. Explain consumerism and differentiate between your well-being and the corporate well-being. Core message: Checking accounts and savings accounts are indispensable, powerful, and potentially dangerous tools. Demonstrate how to use a checking and savings accounts. Identify what a checking account is. Practice using a checking account and debit card. Compare and contrast debit cards and ATM cards. Explore the features of automated financial services such as, electronic transfers and bill paying online. Explain the importance of always knowing the true balance of your checking account. Practice reconciling your bank statement. Identify check holds and minimum balances. Examine the various types of financial services and the differences between banks and credit unions. Identify mistakes you can make with your checking account that could lead to bad credit. Module 5 Junk in the Trunk! Core message: Detailed interactive checking account module that allows your students practical guided practice using a checking account to be used after Module 4, Road Trip. Core message: Use credit cards very wisely or you will be hurt. Select strategies to use in handling credit cards and debt. Explain how credit cards and other unsecured loans work. Identify and define credit, loan, annual percentage rate, interest and principal. Explain the importance of timely payments. Explain the grace period with credit cards. Identify the dangers of financing long-term debt with credit cards. Compare various credit card offers to identify the ramifications of making purchases with credit. Compare and contrast financial institutions that offer credit cards. Identify the consequences of going over your limit and paying late. Explain how to manage credit responsibly. Core message: Detailed interactive credit card module that reinforces the curriculum in Module 6, Sucker Punch! Core message: Burning money introduces the concept that money is a limited and perishable resource: we spend our lives trying to have enough of it, and once we've spent it, it's gone. Learning to accept responsibility for every spending decision. How to determine if an expense is a fixed or a variable expense. Recognizing"good" from "bad" money burns. The importance of record-keeping in the budgeting and saving process. How to easily keep detailed records of income and expenses. Illustrate why savings plans are worthless if they don't work hand-in-hand with a budget. Episode Two: Work Harder! Make Less! Core message: This module allows students to see how their money habits in high school will have an enormous impact on the quality of their life the minute they begin to go to college and/or begin to support themselves. It also shows them why every budgeting and saving decision is impacted by spending decisions. Has the student identify in an interactive exercise the consequences of bad consumer decisions. The impact of paying late on your credit score. The continuing impact your credit score has on many areas of your life, from employment, to housing and insurance. The difference in gross and net pay, and the impact that difference makes on life. The budgeting process, its complexity, and the impact of bad decisions on the budgeting process. The episode explores why bad money decisions themselves happen. The episode allows the student to calculate how one bad decision can lead to months or years of extra expense. The episode explains the role of the free enterprise system and the responsibilities that system places on the consumer. The episode allows the student to discover the critical importance of comparison shopping, and doing your homework. The episode teaches checking writing and account balancing skills. Episode Three: Work Less! Make More! Core message: Incorporates a student's individual seven-day spending record to illustrate the "work less, make more" principle. The episode also helps each student understand key money management principles. The episode also emphasizes the importance of savings in maintaining a budget. If you don't have savings, how do you pay for unexpected expenses? Demonstrates in an interactive exercise the differences between "wants" versus "needs," and then evaluates each student's expenses to determine which were "wants" rather than"needs." Students work through an interactive exercise on fixed and variable costs, and then determine which of their expenses were fixed or variable. Identifies in an exercise how many variable expenses can be lowered. The student shows an understanding of impulse buying, and then determines which expenditures were "impulse" expenses. Students will navigate an interactive exercise which illustrates the impact of unexpected expenses or our quality of life. The exercise requires each student to list his or her own unexpected expenses. Episode 4: Me? A Millionaire? Core message: Budgeting, savings and spending decisions and the importance of planning for financial issues and retirement. The importance of planning ahead for financial issues and retirement. Demonstrates the importance of beginning a savings plan early in life. Identifies the importance of discipline when it comes to financial decisions. Demonstrates the importance of making conscious decisions rather than acting on impulse. Explains the importance of understanding the difference in investments and permanently depreciating assets and investing in income-producing assets. Identifies the reason for paying yourself first and illustrates that this key habit can be learned by anyone. Teaches the importance of learning how to make smart decisions when it comes to money by doing your research. Identifies the differences in the sources of information available to make decisions. For instance, the difference in advertising and a review by a consumer advocate when it comes to accurate information. Teaches that each consumer is ultimately responsible for his or her decisions in the consumer marketplace. Teaches how to recognize the difference in legitimate sources of information and biased sources of information. Explains the role of consumer advocates in the consumer marketplace. Evaluates the role of advertising in consumer decisions. Demonstrates that education can increase your earning power. Identifies the critical role of compounding interest in building savings. Core message: "Moving Out" immerses the student in the thought processes needed to make moving out a successful experience. Why money problems means you probably have to move back in with your family before you are thirty. Understanding the importance of good credit in the rental process. Why moving out and staying out requires long-term planning and homework. How do you prepare right now for moving out on your own? Understanding renting and leasing lingo. Budgeting for your life as a renter. Should you rent month-to-month or long term? What factors should you consider when selecting your first nest? Common mistakes made by first-time renters. Understanding the role and objectives of rental agents and landlords. Your rights and responsibilities as a renter. Smart and dumb ways to furnish your first nest. Renters' insurance: do you need it? Core message: "Home buying" looks at the reasons young people should understand the home buying process many years before they actually buy their first home. It teaches the skills necessary to prepare for the best and least- expensive home buying experience down the road. How do you know when you're ready to consider buying rather than renting? Why buying a home is a much more complex and potentially dangerous financial transaction than renting a home. What steps should a young person take now to ensure a better home buying and mortgage experience down the road? Understanding home buying and mortgage terminology. What is a sensible process for finding the best home and the best mortgage? Understanding the role of mortgage brokers, lenders, and real estate agents in the home buying process. Core message: "Gambling" presents a detailed look at the societal costs and potential benefits of organized gambling. Understanding the odds of winning in professional gambling: the theories of probability and predictability and the difference in an "independent" event and a "dependent" event. What is the difference in the normal gambles we take daily in life and gambling online, at a casino or at a slot machine? Understanding the clues that identify a casual rather than a habitual gambler. When does gambling become a problem rather than a pastime? How to recognize when gambling is becoming a problem. How organized gambling uses psychological techniques to manipulate customers. Why and how online gambling sites target young gamblers. Core message: "Tax Me!" reviews the impact of taxes on our lives and explains to the student the responsibilities required of all taxpayers. What is a tax and why do taxes exist? When are you required to start paying taxes? Understanding the "Ability to Pay" and the "Benefits Received" concepts of taxation. Understanding the principles of "progressive" and "regressive" taxation. Understanding the different types of taxes and the importance of your decisions concerning taxes. Understanding the principle of tax deductions. The importance of keeping records and filing taxes on time. Understand tax terminology and key tax forms. Core message: "Giving Versus Getting" illustrates the value of giving back to the community, demonstrates the role of charities and not-for-profits, and teaches the student how to responsibly become a contributor to charitable causes and organizations. The personal and professional benefits of being a charitable person. How young people can make an important impact with their charitable efforts. Understanding the differences in a "for profit" and a "not for profit" organization. The role of not-for-profits in an economy built on the for-profit ethos. Understanding how to evaluate the merits of a charity or not-for-profit organization. Understanding how to recognize scams in the charity world. How to recognize charity scams aimed specifically at young people. Module 14 Who Needs Money? Core message: "Who Needs Money?" focuses in great detail on the enormous impact of even a minimal college education on the lifetime income of any young person. The concept that educational decisions made in high school will have a lifetime impact on the average student's income. Determining how much lifetime income various years of education bring to the average student. College or trade-school options for students with little or no income or poor grades. The great educational value offered by community colleges and state-supported schools compared to many private schools. The difference in a "job" and a "career". How to choose a trade school or other commercial school. Module 15 Don't Forget the Parachute! Core message: What is insurance, why do we at times need it, and how do we find the best insurance at the lowest cost? Understanding the concept of "risk." How do you determine what insurance you need? How do you "shop" for that insurance? Understanding all the factors that impact auto insurance cost and coverage. How a young driver selects the proper types and amounts of auto insurance coverage. Understanding your responsibilities when driving under your parents' insurance umbrella and the consequences of not meeting those responsibilities. Understanding health and life insurance. What is a sensible way to shop for the best insurance coverage? Core message: "Broke!" explores the causes and consequences of bankruptcy. It explores in detail the alternatives to bankruptcy, and discusses the different types of bankruptcy remedies available to a consumer. Why does a young person need to learn about bankruptcy? What are both the practical and legal definitions of bankruptcy? What are the practical and legal consequences of going bankrupt? How should a person evaluate whether or not to file for bankruptcy? How do you tell the difference between a legitimate debt settlement organization and a unethical or ineffective organization? What scams are aimed at consumers in serious financial trouble? Module 17 Pay Me While I Sleep! Core message: An investment account can put your money to work for you while you do other things like sleep, and right now is the time to start that account. If you are wise with your money, you can start an investment account now. What is the difference in "saving" and "investing"? It is impossible to be a consistent saver or investor if you don't have spare cash. What is "opportunity cost" and how does that concept impact your ability to save or invest? When you have unnecessary debt, such as debt on credit cards, you're usually paying more in interest on that debt than you can make on an investment. Unnecessary debt is usually invisible debt: we don't think about the fact that it impacts our ability to invest. The impact of compound interest on savings and investment accounts. What is an event "Time Horizon" and how does it impact our savings and investing decisions? How do you determine how much risk you can undertake when you make investments? Why do some people make bad risk-tolerance decisions? What is "liquidity" and how does it impact our decisions? How do you judge whether or not an investment is successful? Understanding "ROI" and "Rate of Return." Why don't more people invest regularly? Goal setting for your savings and investment plans. Understanding the "Rule of 72" and how to use it. What type of investments can young people make? What exactly does the term "risky" mean in relation to savings and investment plans? How do you keep from falling for pressure and deceptive sales tactics when you invest? What is a good strategy for starting an investment plan right now? What is an investment "portfolio"? What are the basic types of investment vehicles? What are the relative risk levels of various investment vehicles? What is the role of investment vehicles such as 401k's in a young person's investment plans? What is the main objective of even the most honest person selling investments? Why is it important to question all investment advice and gather a second independent decision before making any investment? Note: This module is designed to be done directly after Investment, Module 17. Core message: You are responsible for making sure you have funds to lead an independent life when you retire. By the time most people start worrying about what they will live on after retirement, it is nearly too late for them to develop a retirement plan. You cannot depend on the government or your place of employment to take care of you at retirement. You will need to save a much smaller percentage of your income for retirement if you start now rather than later. How do you determine how much of your income you should set aside for retirement? How does inflation impact a retirement or savings plan? Why investment accounts can pay a higher rate of return than savings accounts. Factors that impact your success as an investor who is saving for retirement. Why high-interest loan accounts such as credit cards dramatically lower the funds you have available to invest or save.